Image caption Molly Wigmore's sister said after the inquest: "We have lost a good soul"
A woman died after a call handler refused to send a crew to a fire in her house, an inquest was told. 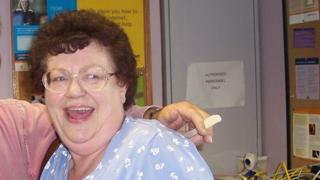 Molly Wigmore, 76, died at her Plymouth home in October last year. The first 999 call was made by a neighbour at 05:17 GMT but the caller was told it was "only smoke in the area". Devon and Somerset Fire and Rescue Service said the call handler who took the first call had been sacked. Another officer has received a final written warning. The second call by another neighbour was made at 06:44 with a fire engine arriving at 06:50, the inquest in Plymouth heard. The hearing was told a neighbour shouted "if she's dead, it's on you," at firefighters when they arrived at the scene. Station manager David Roddy said: "More care should have been taken by the operators to establish the full facts. Plymouth coroner Ian Arrow said: "This was an exceptional case with a tragic outcome." Mr Arrow, who recorded a narrative conclusion, accepted that it was a "one-off individual failing". He added: "A decision not to deploy should be exceptional and made by the most senior person in the control room." Ms Wigmore's sister Sheila said after the inquest that she was "satisfied this was a one-off, but it is too tragic because we have lost a good soul". Neil Blackburn, head of operations for the fire service, offered the victim's family and friends his "deepest condolences".